Soft fresh lactic cheese. These little cheeses are a firm favourite amongst young and old as the taste appeal to all. Lightly salted, mild, clean acidic flavour with a creamy texture. Each cheese is rolled in italian herbs and spices. Beautifully presented in individual wooden cheese boxes. 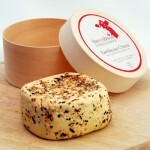 A very versatile cheese, that can be sliced or spread, used to make savoury tarts, dips or sauces.